After my experiment with a Greek Symposium (where we did at one point shout “Toga! Toga! Toga!”), I got curious about the origins of the modern, pseudo-Greek, fraternal Toga Parties. And I found the photo above. Yes. In the middle, that is indeed President Franklin D. Roosevelt. In a toga. FDR’s critics often compared him to a dictator, going as far as to refer to him as “Caesar”. To poke fun at the name, his wife Eleanor threw him a “Dear Caesar” themed birthday on January 30th, 1934, his 52nd year of life. The costume pictured on the left is from the FDR Library & Museum and was worn by a friend of the Roosevelts to the ball. According to Henrietta Nesbitt, head of the White House housekeeping and cooking staff, the birthday cake was a fruitcake, made with dates, raisins, almonds, citron and orange peel (source). 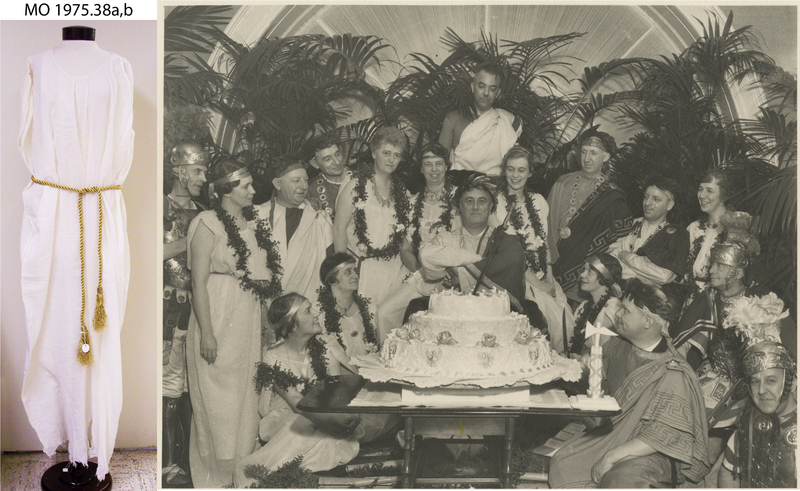 Did Franklin and Eleanor Roosevelt throw the first toga party on record? Perhaps. Were Greek-themed toga parties actually a thing in pre-war London? I’m uncertain. Although the idea of a college fraternity stemmed from the Greeks, togas are Roman. So how did one become associated with the other? It’s believed to have been invented in the 1950s, but the only source is a self-referencing reference about a party at Pamona Collge in 1953. I apparently need to start doing oral histories with Pamona College alumnus (know any?). But this lineage may be entirely made-up. The toga party simple may have been a creation of popular culture. Toga is wild and crazy…Toga is an excuse to let loose. Toga is bed-sheet chic and drapery decadence. ‘What do you think all this toga business means?” I asked. My favorite part is when he describes a campus-sheet shortage due to over-zealous partiers and wary linen franchises. Read the whole article here. The Official Preppy Handbook, a parody published in 1980, gives this advice: “Toga party- Girls wear designer sheets, men wear the kind from the linen service. If accompanied by a Roman-style dinner, these sheets may go home stained with red wine, though serious drinkers might switch to a grain alcohol punch around 10 o’clock. Since dancing in a toga is impossible, getting drunk is the primary activity.” In just two years, toga parties went from the height of college fashion to passé enough to be parodied. There are a lot of gaping holes in the story of the toga party. The frustrating part about researching the history of alcohol is that apparently people were too drunk to remember.